Long holiday's over and it's almost time to get back to reality. Having Steve home for over a week totally put me in a vacation mode and I think I'll have a hard time getting back to normal life. Especially my tot. He absolutely enjoyed having daddy around all the time. About 50 times a day, he says he loves daddy so much and he's sad when daddy goes to work. Sweet boy. We hosted Christmas and cooked a lot of stuff but as most people's Christmas dinner especially involving kids, it was so chaotic by the time food came, I had no chance to take pictures. It's a shame because Steve cooks this killer prime rib every year that I wanted to share. We made a few veggie side dishes and my favorite side was prosciutto wrapped asparagus. Super simple and yummy. Anyway, after a few heavy meals over the past week or so, we got to the point where we wanted to whip up something simple and enjoyable. Like our normal week night meal. I've always wanted to try this recipe ever since I first found it. I love every element of this dish. 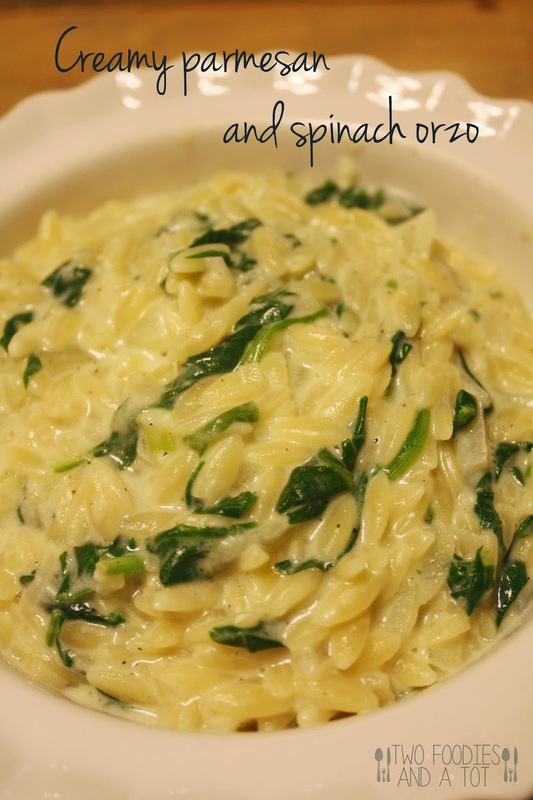 Orzo, spinach and who doesn't love cheese? It's a great side for a nicely grilled steak or chicken. 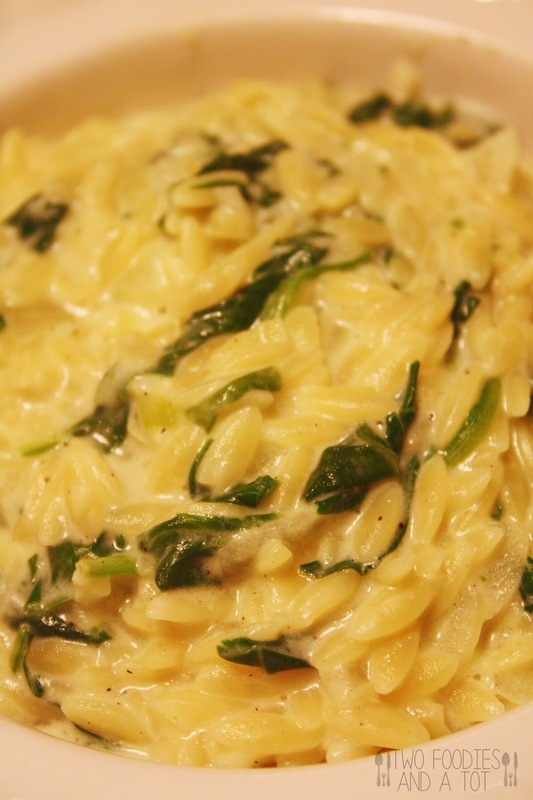 It's somewhat like a marriage of creamed spinach and mac and cheese. I added more spinach than suggested amount to trick myself to think it's healthy. Haha. And we love spinach. If you put cubed grilled chicken or something, it can very well be a quick week night dinner on its own. 1. Cook the pasta according to the package directions and drain well. 2. Heat olive oil in a pan and cook garlic and onion until onions are translucent. 3. Add flour and stir until lightly browned about a minute. Whisk in milk and cook while stirring constantly until slightly thickened. About 3-4 minutes. 4. Add spinach to it and cool until just wilted. Stir in Parmesan until melted. Add drained orzo, salt and pepper to taste and toss gently. Serve immediately.